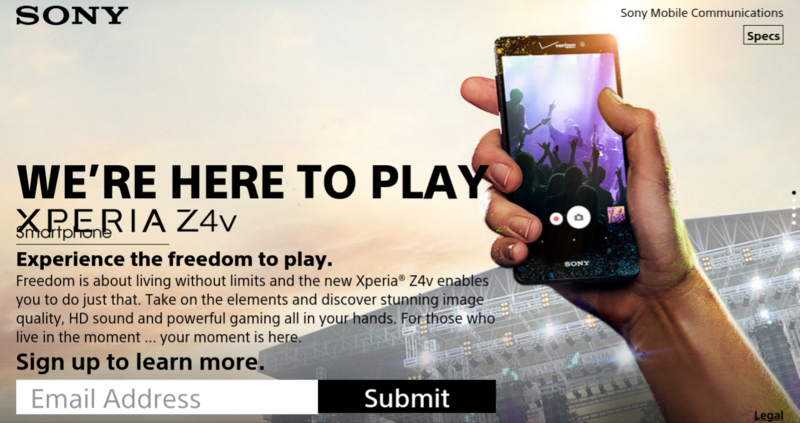 Remember that time Verizon announced it will carry a version of the Xperia Z4 called the Xperia Z4v three months ago? And said it would be out "this summer?" Well, summer ends in exactly... tomorrow, and the phone still isn't out. It was actually allegedly supposed to be released over a month ago, but now any kind of launch before October seems highly unlikely. Some guy got one anyway (somehow) and reviewed it in this video on YouTube. Verizon's site, by the way, says the phone is still "coming soon." As I hope we can all agree, this is tremendously, mind-bendingly dumb for several reasons. First: don't announce a phone you won't be able to ship to anyone for over 3 months, Verizon (or Sony). That's just asking for angry customers all up in your social media (assuming anyone cares about this phone). Second: the Xperia Z5 family is already available and has been for weeks in other parts of the world, and you're going to release a Z4-based device? Why? Fact aside that anyone seriously interested in a Sony phone is going to tell you to take a hike pawning off this thing like it's a shiny new device, it's just complete nonsense on its face. I can understand, for example, why AT&T might start selling a Galaxy S Mini a year after its global debut: because they get a great deal on 84 unsold pallets of them sitting in some dingy Samsung warehouse down by the docks (meaning sales are near pure profit), and the people buying these phones care about as much about their phone being on the cutting edge as, say, their preferred brand of mayonnaise. But something that's supposed to be "high-end" and niche-catering (read: Sony fans) like this Z4v? You may as well try to convince That Guy Who Leases Every New Corvette that Last Year's Corvette is just as good as This Year's Corvette. He wants the new one, PERIOD - and don't try any funny business, guy. So, when will Verizon sell the Z4v? Probably at some point soon-ish - the phones have clearly been built, and Verizon's almost certainly under some vague obligation to buy an amount of them from Sony. Therefore, it seems likely that you can expect the Verizon Z4v to arrive just in time to be the highlight of Verizon's Amazing Black Friday Sale. Don't buy one.